Complete portofolio of products and services for all types of industrial areas. Outstanding resistance to corrosive chemicals and moisture, used in a wide range of interior and exterior applications across many industries. Rubber lining systems provide excellent protection for equipmentes and industrial installations. Protect both metal and concrete surfaces against corrosion and abrasive media at high temperature conditions. Floor linings based on synthetic resins protect concrete substrates from corrosive attack and prevent penetration by chemicals. Synthetic resin base mortars and screeds are recommended as bedding, tiling, flooring and jointing compound wich assure corrosion protection. Are you looking for the right surface protection solution that has an optimum behavior under the chemical, thermal and mechanical stress you face? You now have the guarantee of efficiently applying anti-corrosion and anti-abrasion protections no matter the industry you are in. You will benefit from complete anti-corrosion protection solutions and a team of applicators with an experience of over 15 years. 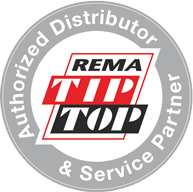 Rema Tip Top Germany in Romania. Discover the entire range of anti-corrosion protection services! Contact us now and tell us how can we help you. We are here to meet your needs! High-performance coatings with integrated micro ceramic particles for different fields of application. Rubber lining systems provid excellent protection for equipmentes and industrial installations. Acid resistant bricks linings and tiling systems with acid proof bricks and also combined complex systems, resistant to the action of aggressive chemical agents. All the necessary activities required by periodic maintenance of the equipment’s corrosion protection system. Chemical storage tanks. Pipes, agitators, scrubbers, ventilation. Areas for washing drum. We act responsibly in all our projects and we contribute to industrial development and environmental protection. We constantly involve ourselves through our services and offered products, in wastewater treatment and harm reduction emitted by thermal plants. We answer the needs of environmental protection with premium products, designed to provide effective corrosion protection. Thus reducing installation and maintenance work on the equipment and increasing their lifespan.